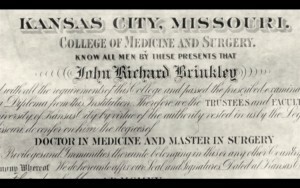 “On May 7, 1915, the Eclectic Medical University of Kansas City presented him with a certificate signed by its president, Dr. Date R. Alexander. To become an alumnus of E.M.U. (later described in court proceedings as ‘vague, obliging and long defunct’) cost Brinkley one hundred dollars and got him licensed in eight states” (Brock, 25). So: yes, he had this diploma (and a number of other diplomas and accreditations), but it doesn’t mean what you might think it means. Lee, 19; 21-22; “[H]is only real credentials are those from the old Kansas City University of Medicine and Surgery, a diploma mill that sold diplomas for from $200 to $1000” (“The Very Idea,” The Springfield Leader, 16 Jun 1930, Mon, Page 8).